When ships, submarines and port facilities exposed to the corrosive marine environment need to be repainted, get to clean steel quickly and safely without any messy cleanup using our shrouded power tools! Old paint is removed and packaged in one step using our powerful VAC-PAC® HEPA vacuum and deposited directly into 55-gallon drums, safely sealed and ready for transport and disposal when full. No costly containment is required for hazardous jobs, because dust is captured at the surface, before it’s emitted. See how commercial and military marine entities are minimizing exposure, reducing overhead and staying compliant by using the Pentek System! Pentek, Inc. supplied several multi-tool VAC-PAC® systems to Northrop Grumman Corporation as part of the $453.3 million maintenance program on the USS Enterprise (CVN 65). Work took place at the Northrop’s shipbuilding sector in Newport News, Va. These systems used Pentek’s vacuum extension manifolds to accommodate the long run from the top of the dock to the tanks being remediated. Portsmouth Naval Shipyard in Kittery Maine ordered a VAC-PAC® model 12 to complement the existing unit it has been using since June of 2003. The new purchase included a Corner-Cutter® Needle Gun, a four tool manifold, and various accessories. Portsmouth is known for its overhaul capabilities for the U.S. Navy’s nuclear powered submarine fleet. 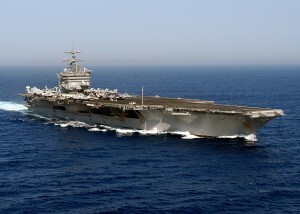 The USS Emory S. Land was recently refurbished via a Navy contract which called for the performance of “rip-out, habitability removal and re-installation, modifications, and re-configuration.” The competitively bid contract was awarded to Pacific Ship Repair and Fabrication of Port Orchard, Washington.Pentek decontamination technology was employed to handle lead abatement in a variety of shipboard locations. In addition to a multi-tool VAC-PAC® system, Pacific Ship purchased five man-portable systems featuring Pentek’s Compact Vac HEPA vacuum.